The Acuae line is focused on the water treatment, especially in irrigation reservoirs, in a natural and totally environmentally friendly way, protecting the irrigation machinery and optimizing the quality of the water used, avoiding the problems produced by development of algae. In this way, the water treated with Acuae can be used without limitation in irrigation in both conventional and organic agriculture. However, this product, in addition to being recommended for the optimum conditions of wáter quality , can also be used to derive great benefit for water source, ponds or lakes that embellish golf courses, since Acuae is indicated as a preventive solution to control fungi. In this way, Acuae ensures the results without application of aggressive products to the crops and to the soil, so that the treated water can be used without limitation for both conventional and organic farming. 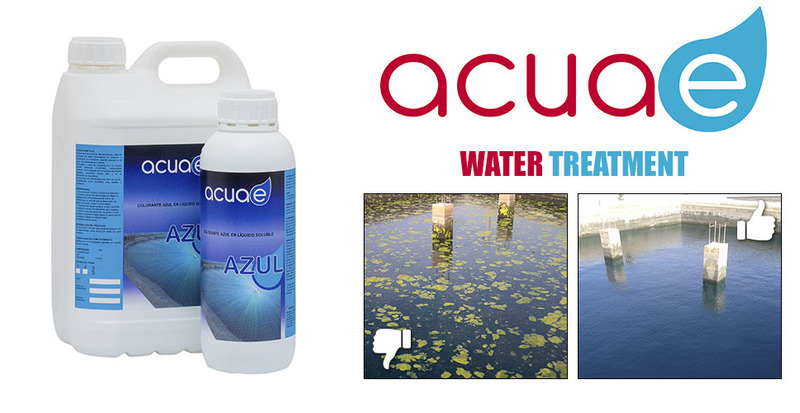 Within the Acuae range you can find the following water treatment products: Acuae Azul and Acuae Bac. Agriculture is by far globally the largest consumer of water. 70% of the world’s water consumption is for crop irrigation. In several developing countries, water intended for crop irrigation represents 95% of the water consumed, and plays a key role in food production and food security. In most of these countries, the development of future agriculture strategies involves the maintenance and improvement of the expansion of this irrigated agriculture. By using our line of products it is possible to obtain at any time a machine and water for irrigation of optimal quality, with the best possible conditions, thus avoiding the problems produced by proliferation of algae, such as plugging of filters. A problems that can generate a high cost for the farmer, since the plugging of the filters can lead to an incorrect irrigation of the crop, thus lack of water, which is necessary for the conditions of the plantation. In consequence, it leads to higher costs than the initial ones of filter replacement. Therefore, its use is especially aimed to the waters of reservoirs which irrigate the crops. Since it is a range of products totally harmless for the people and for the aquacultural and terrestrial fauna, it avoids the destruction of the bacterial fauna, which is very beneficial to the soil. The product can be used as well in another cases, such as those described below. It is important to know that the water used for irrigation can come from natural and / or alternative sources. Thus, natural sources include rainwater and runoff surface (lakes and rivers). These are the resources that must be used in a responsible and sustainable way. The amount of water that comes from the rainwater depends on atmospheric conditions of the area. Surface water is a limited resource, that is why, it is commonly required to constuct reservoirs and dams for exploitation with a significant environmental impact. On the other hand, alternative sources of irrigation are the reuse of municipal water and drainage water. In any case the use of recycled water can have adverse effects on public health and environment. It will depend on the application or use of the recycled water, characteristics and limitations of soil, climate conditions and agricultural practices. Therefore, it is essential that all these factors are taken into account in the management of recycled water. The quality of water used for irrigation is crucial for the production and quality of products in agriculture, maintaining the soil productivity in a sustainable and protective manner for the environment. For example, soil physicochemical properties (ex. soil structure, stability of aggregates) and permeability are soil characteristics highly susceptible to the type of interchangeable ions that come from irrigation water. The quality of irrigated water can be determined by laboratory analysis. The most important factors to consider in determining the validity of the water used for specific agricultural purposes are PH, salinity risk, sodium risk (RAS), risk of carbonate and bicarbonate in relation to the Ca & Mg content, trace elements, toxic elements, nutrients and free chlorine. Acuae is also a range of products that is especially indicated as a preventive solution to fungi control. In this way, Acuae guarantees results in the plants without the applying aggressive products with the crops and with the soil. Therefore the treated water can be used for irrigation without limitation for both conventional agriculture and organic agriculture. Acuae is easy to use, since it is poured directly into the pond, source or reservoir to be treated and, due to its high solubility, disperses in a short period of time until its homogenization, reducing rapidly and effectively the development of algae in the water, which remains in the best possible conditions. Acua-e blue, is the most easy and economical way of controlling algae whilst minimizing its population and respecting the ecosystem, creating a natural blue appearance of the water. It is formulated from an artificial colour in highly concentrated soluble liquid, used as an artificial colour in the food industry and in the manufacture of cosmetics. Acua-e Blue is extremely easy to apply, obtaining very fast and enduring results. • It reduces the development of algae as it reflects the photosynthetic blue radiation. In a way that it does not allow algae to form, as they are not able to photosynthesize. • It beautifies the murky and dirty water, given it a blue crystalline appearance. This product, Acuae Bac, is totally natural and respectful with the environment. It is used in the biological treatment for the control and maintenance of waters and rafts. Among its benefits, this is a product totally harmless, which does not use chemical agents, is suitable for ecological cultivation, avoids the proliferation of algae, prevents plugging of irrigation systems, filters, drains of rafts for water of agricultural use . It also maintains water reservoirs free of agents which feed the algae: waste from inputs in fields or wastewater discharges. It also maintains clean water in ponds, lakes, fountains in gardens, lakes of golf courses, hotels, among others. Acuae Bac is recommended 100%, to be poured directly into the pond, the source or the reservoir, and its high solubility is dispensed in a short period of time until its homogenization. This type of product can be applied without any problem at any time of the year, except when the water temperature is below the freezing point , with a dose of 1 liter of Acuae Bac per 100 to 150 square meters of surface of the raft. The application is not recommended after using Potassium Permanganate or in this case it would be necessary to leave 30 days after the end of the application of Permanganate.